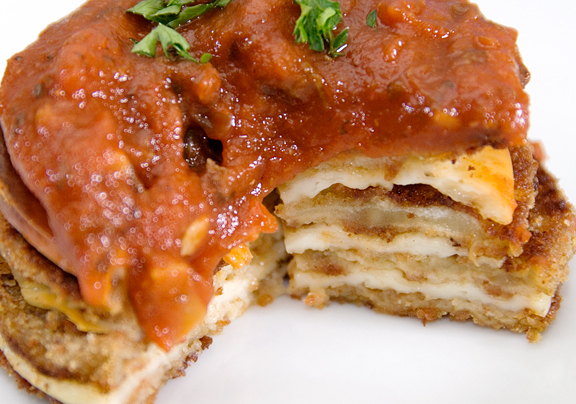 Last night I made eggplant parmigiana (or Pecorino Romano is more like it). I hadn’t ever made this before, but I had eggplants, bread crumbs, mozzarella, some leftover sauce… I sort of wung it and it turned out different from what I had expected, but wasn’t bad at all. I have thoughts for improvement the next go around which will be soon because I have another eggplant waiting in the wings. These should improve on texture and the reduce the “vomit-like” appearance of the sauce. I peeled the eggplant completely, then sliced into thin (thinner than 1/4 inch) discs. I dipped the eggplant slices in two beaten eggs and then dredged in bread crumbs. Then I fried the slices in a few tablespoons of olive oil until browned on each side and set them to drain on paper towels. In a baking dish, I layered eggplant, mozzarella slice, some shaved romano, eggplant, mozzarella… and baked in a 350F oven for 45 minutes. 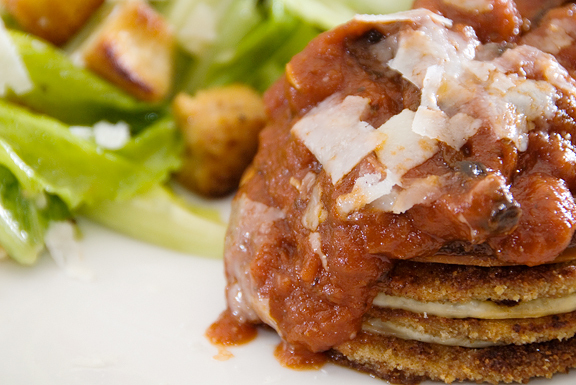 Serve with some warm tomato base sauce. Also – I ran out of breadcrumbs and tried frying up a few slices sans crumbs. Don’t do that. Actually, the best part was the salad. I haven’t made Caesar salad in an age. I used to make it in high school because my parents loved it, but… It’s quite easy to do although I never have anchovies on hand. Ah well, I’m fine without it really. I didn’t have croutons on hand, but that is never a problem because I love to make my own. It’s really easy. Mince a clove or two of garlic. Cube some bread like french bread. Heat a few tablespoons of olive oil in a frying pan and stir the garlic around until fragrant. Add the bread cubes and a dash of salt and fry it up. If it’s not crisp enough, you can chuck them into an oven and bake to harden the croutons. I learned to do this in camp in Chile with their brick bread which I wasn’t a huge fan of unless it was fried like this with garlic. Boil water in a small saucepan and put the whole egg (shell and all) in for 45 seconds and remove. Let cool. Break egg into bowl and mix with garlic, salt, pepper, lemon juice, and Worcestershire. Whisk the olive oil in by thin steady stream to ensure good emulsion. Mix in the cheese if grated (otherwise dress the salad with it last). 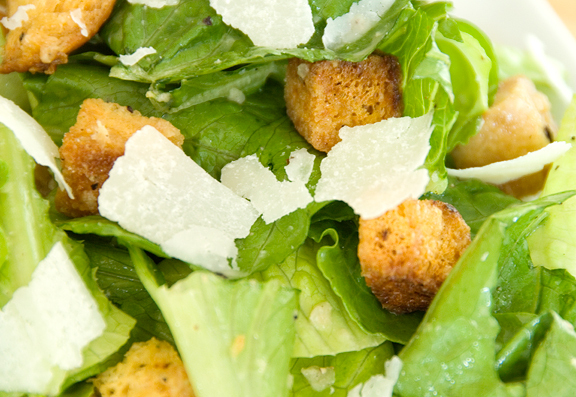 Toss dressing with greens and croutons. Sprinkle shaved cheese on top. Serves 4. Your blog is so cool. I find it so inspiring, and all of your recipes look amazing and that they would be in a magazine or somthing. Also your photograph is amazing. Thank you for sharing your recipes. Hi! I have been reading your blog regularly for a while now and I have to tell you that it is one of my favorites. Your photographs are beautiful, your recipes delish, and you seem like someone I’d want to be pals with. :) Also, I am rooting for you…I hope you get well and stay well. Lisa – Thank you so much, that was a really sweet comment. I’m so glad you enjoy URB and I really appreciate your well wishes. Thanks! Hi, just stumbled on your blog while searching for a seared tuna recipe. One quick question, do you use the entire egg, white and all, or just the yolk? John – the whole egg. 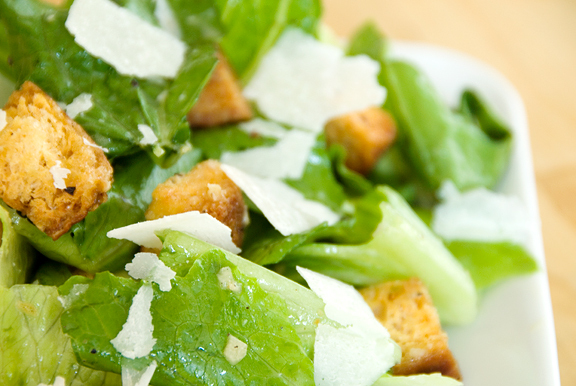 Wow…finally found someone who makes caesar salad just like me…so I must take a look at your other recipes…I’m sure I’ll find a lot of things that appeal to my taste buds!